Manage multiple blogs, posts, and categories. Outputs HTML files that you can upload to your Web space. No script configuration required. 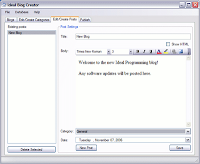 Includes an easy to use template system, and a WYSIWYG or plain HTML editor for posts.